The whole of India gasped with anticipation and awe between January 25th – 27th as US President Barrack Obama and his wife Michele visited India as state guests, and attended the prestigious Republic Day parade. Although it was Obama’s second visit to India, it was for the first time that a US President was part of Republic Day celebrations, which actually symbolized several things, besides letting go of Cold War anti-Americanism bitterness of last few decades. As US President watched the military might of India, and experienced the cultural diversity which our nation offers, several crucial business and financial deals were approved, and promises were made, which can actually pave the way for glorious Indo-US business relations in coming years. As of now, India accounts only 2% of US imports and meager 1% of exports; while they do $560 billion business with China every year, only $100 billion worth of goods and services are exchanges with India yearly. US Government’s business development and finance arm: U.S. Overseas Private Investment Corporation (OPIC) will give an assistance of $1 billion for Micro-SMEs and SMEs from rural and urban India. This decision was made to encourage entrepreneurship and business, along with technological assistance. Soon after this announcement, Yes Bank said that they have signed a MoU worth $220 million with OPIC for lending credit to SMEs from India. Wells Fargo bank would be the official project coordinator for this scheme. U.S. Export-Import Bank will provide an assistance of $1 billion for Make in India campaign launched by PM Modi, which will help made in India products to be exported to US and increasing trade relations in this sector. Special focus would be provided in infrastructure development. One of the most important decisions taken after Obama’s visit to India was breaking the deadlock on Civil Nuclear deals, which was stuck since last decade. India agreed to amend few of it’s clauses related with Insurance, and in return US pledged to make it go live. India has created an Insurance pool worth Rs 750 crore led by General Insurance, and contributed another Rs 750 crore to make the insurance regulations stronger. In the coming days, we can observe some major breakthrough in this direction, which can help solve several problems such as energy needs, industrialization progress among others. US Trade & Development Agency will pitch in with $2 billion investments in the renewable energy sector in India, which includes Solar Power and Wind Energy to help India solve its energy crisis, and to bring down costs related with power production using traditional means. In addition, US Government also assured India that they will help us to achieve the target of producing 100 GW via solar energy with an investment of $100 billion. A high level US India Strategic and Commercial Dialogue has been created which will help break the red-tape logjams which Indian government is so notoriously famous for. Obama was blunt when he said that India had “too many barriers, hoops to jump through, bureaucratic restrictions that make it hard to start a business or export or import or close a deal”. This high level committee will ensure that all Indo-US trade decisions and investment plans are accomplished fast track, and there are no delays. Obama promised Indian government that he will look into the H1B visa issues, which had been causing much trouble to Indian businesses who wish to expand their base in USA. A comprehensive migrant reform draft would be soon created by US, especially targeting Indian techies and businesses establishments for making H1B visa regulations easier and trade-friendly. US Government has signed MoUs with Governments of Uttar Pradesh, Andhra Pradesh, Rajasthan for developing smart cities in Allahabad, Ajmer and Visakhapatnam. US Government will provide funds and technical knowledge for feasibility studies, study tours and workshops to materialize the idea into reality. US Companies have been stating that India has some old and useless laws related with Intellectual Property Rights, especially in the pharmaceutical sector where US has banned several Indian companies. Indian Government has promised to upgrade their laws related with IP protection, which will further boost Indo-US trade relations. Along with these, there were several other important pacts and agreements signed which concerns environment, Asian policy, defense deals, FDI issues and more. 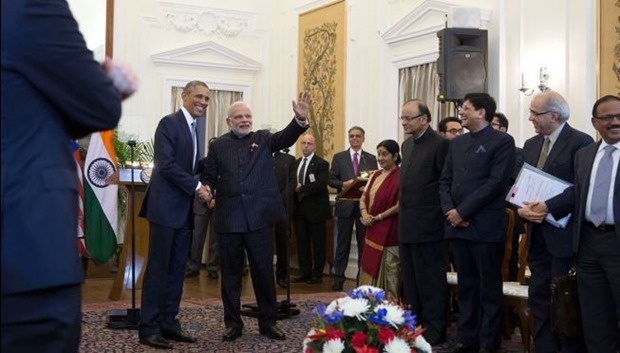 Here are the official summary of the Obama visit by Indian Government and the US Government. You can also read the remarks and speech made by Obama at US-India Business Council Summit in Delhi on the eve of Republic Day.